Breathtaking views and relaxing terraces provide the wow-factor at Villa Roma, a fabulous luxury villa in Los Flamingos. This beautiful five-bedroom villa oozes classic Spanish style, with all the latest technological gadgets and the most amazing location. As soon as you enter the double-height hall of Villa Roma, with its lofty ceiling and glassed-in staircase, you get an immediate feeling of space and grandeur. It’s a place that’s at once luxurious yet relaxing, with a fluid open-plan living space that overlooks beautiful landscapes. The generous dining and sitting room has two separate living areas: the TV area with a sizable corner sofa; and the central living room has plush Italian-style sofas and an elegant chaise-longue, where you can gaze out across the terrace with a glass of something chilled in hand. The dining area is connected via a Roman-style archway, and the whole space opens out onto the terrace so you can dine indoors or out depending on the time of year – this villa is just as idyllic in the winter as it is in summer. It’s all very light thanks to wall to wall French windows that lead to the terrace; all three rooms can be opened up completely, offering an uninhibited view of the garden, golf course below, and countryside beyond. In total there are five bedrooms spread over three floors, so there’s plenty of room for a large family and the nanny, too. Upstairs, the main bedroom suite has a huge, round Jacuzzi bath, and glazed doors onto a private terrace which is shared by the guest bedrooms next door. The ground floor bedroom is ideal for children, as there are twin beds plus a sofa-bed which could accommodate another child. There’s a further den-like basement bedroom which also has a sofa bed, as well as a sauna. Designed for entertaining, the kitchen has a side-by-side fridge-freezer, with chilled water dispenser and ice-maker, plus a cosy breakfast booth in a window alcove. From here you can access the terrace to take breakfast in the warm sunshine. This is a house for tech-lovers, with a home automation system to control the surround sound and TV. Film buffs can make the most of the sleek sound-proofed cinema room with a full size wall-mounted screen, which features two rows of plush seats with foot stools so you can put your feet up and enjoy a movie in style. For late night drinks with friends there’s also a small cocktail bar with funky LED lighting and a great sound system in case you fancy bopping the night away. The gardens at Villa Roma enjoy exceptional views of the surrounding area, from the Los Flamingos golf course across rolling hills covered with trees, down towards the sea. The Roman-style pool with wide steps and seating ledges, is located close to the house, perfect for an early-morning dip or a late-night moonlight swim; six sun-loungers line the poolside terrace. The calming landscaped gardens have floral beds featuring agapanthus and flowering blooms, all helping to frame magnificent mountain and sea views. The long west-facing terrace wraps around the front and side of the house, and has everything you need to enjoy an al fresco dinner. The professional outdoor kitchen has a sink, prep-area and a real charcoal grill ready to sizzle those steaks. There’s plenty of dining space on the terrace, as well as rattan sofas, armchairs and a table for relaxing and hanging out in the warm Mediterranean air. For your comfort your rental includes around 10 hours of light housekeeping per week (usually done in two visits), and a linen change every 7 days. Additional housekeeping is available and payable locally and you also have a property manager who can arrange additional services and staff. When you book a villa with The Luxury Villa Collection, our Guest Experience Team will be on hand to help with all your holiday arrangements to ensure a smooth stay. This villa is within easy reach of a whole range of amazing experiences to add to your travel memories. From adrenaline-fuelled adventures to gourmet delights, private tours, beauty spas to kiddie daycare, we work closely with the best local suppliers to help make your stay extra special. For Spanish Culture, explore the cities of Andalucia with a personal guide direct from your villa. Enjoy a selection of day tours or bespoke itineraries all with a door to door service in air-conditioned vehicles. A perfect choice for a first-time stay in Marbella is the escorted wine and tapas tour of Marbella Old Town, where you can get to know the secret corners of this Spanish centre. Our complimentary hamper is our way of welcoming you to Spain. We can also help you book a private chef to enjoy some delicious local meals, poolside Paella, BBQ or tapas, or even choose something with a more international theme. Entering the villa into a double-height ceiling, you step down a couple of stairs and straight through into the main living room. There are two living areas; the formal lounge in the centre, and the TV room to one side. It’s all open plan and leads to the dining room to the left and out to the main terrace. The dining room is also on the ground floor through the living room, and has formal seating for 8 guests. It leads onto the terrace where you can find another dining area for al fresco meals again seating 8. Food can be prepared in the main kitchen and brought out to the terrace, or you can fire up the BBQ just around the corner from the main terrace. This villa has a fabulous 15m Roman-style pool which takes centre stage in the lawned garden. Indoors, you have a fantastic home cinema in the basement and surround sound systems powered by the domotics, as well as some gym machines and a sauna, also in the basement. Bedroom 1: Master bedroom with king-size bed, flat screen TV with Sky, access to first floor terrace, en-suite with huge Jacuzzi bath, shower cubicle and walk-in wardrobe. Bedroom 2: Double bedroom with access to first floor terrace and shower room. Bedroom 3: Double bedroom with access to first floor terrace and shower room. Bedroom 4: Twin room with sofa bed (suitable for one child) and shower room. Bedroom 5: Large family room with double bed plus a sofa bed, en-suite bathroom with sauna. When I first visited Villa Roma I really had to be torn away from the terrace and panoramic windows - those views are simply to die for. I can see this villa being popular at any time of year - even in winter time you're able to relax with plenty of sunshine, home entertainments and fantastic golf right on your doorstep. Villa immaculate on arrival – really clean both inside and outside, amazing just to spend time outside by the pool looking at the most tranquil view. All the team including the concierge services exceed expectations. It's not often that every box gets ticked but it does on this occasion! Just wanted to say thank you for an amazing stay at Villa Roma last week. It was fantastic and we would definitely like to come again at some point next year. Thank you for last week – we all had a really enjoyable week and are still in awe with how beautiful the villa was! Villa Roma features in our Family Collection as it’s perfectly suited to large families travelling with different generations as well as small families bringing their own staff. Children are more than welcome and there’s a good selection of TV entertainment as well as the fabulous pool. 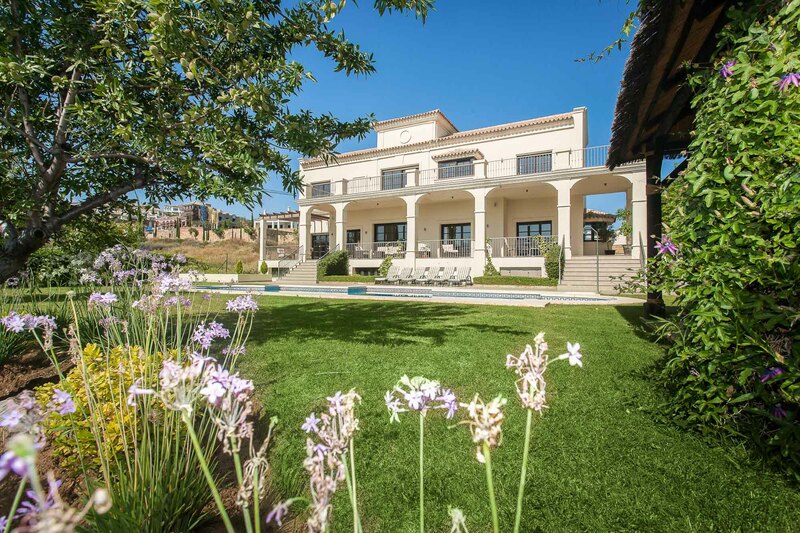 This villa also features in our Golf Collection as it’s excellent for golfers and entertaining business clients thanks to being right on the prestigious Los Flamingos estate. The free Wifi and relaxing atmosphere makes this an ideal villa to stay connected with what’s happening back home, but for some downtime the choice of golf and sports in the area are second to none. Villa Roma is located on the prestigious Los Flamingos development, a neighbour to the luxury Villa Padierna Palace hotel. 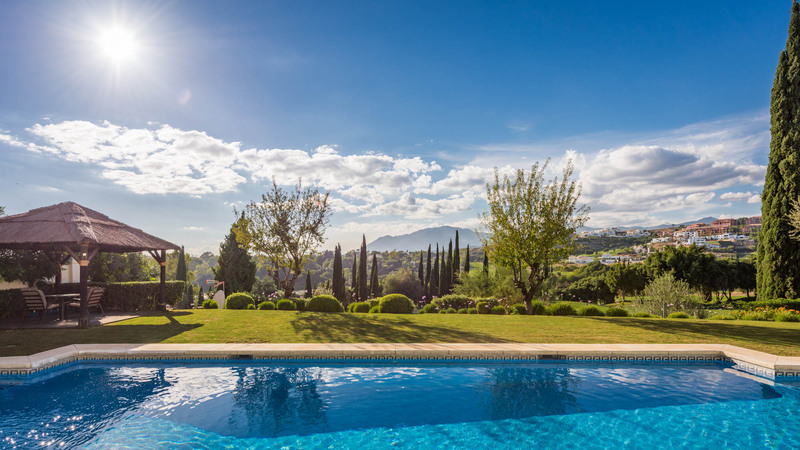 Where Marbella offers glamour and refinement, the area surrounding Los Flamingos in Benahavis has become the destination of choice for famous visitors looking for understated luxury. Located midway between Puerto Banus and Estepona, this exclusive gated community offers an exceptional standard of villa accommodation and is just a short drive from the buzz of the main resorts of the Costa del Sol such as Puerto Banus, San Pedro and Marbella. Los Flamingos is a favoured holiday hotspot for celebrity guests from Hollywood A-listers to reality TV stars, and past visitors include Michelle Obama, Antonio Banderas and Eva Longoria. This villa enjoys far-reaching views across the lake and golf course to the mountains and the Mediterranean sea, which is just 2km away. It's also just around the corner from the magnificent Villa Padierna hotel which offers fine dining and excellent golf. Guests choose to stay in Los Flamingos for its peace and tranquility, yet they never feel too far from the action and excellent dining options of the Marbella coastline. Within an easy half hour’s reach you have kilometres of beaches, chic beach clubs, exclusive nightlife and dozens of restaurants to suit every possible taste. Check availability and pricing here. If it’s not quite what you are looking for then please contact us and we will try our best to help.